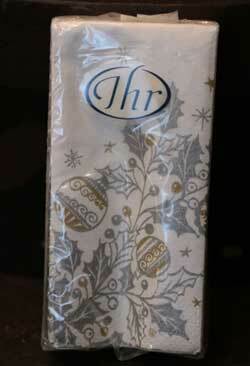 Features a string of applique felt candy canes and holly sprigs against a tea dyed cotton background. Hand dying process results in a different look piece to piece. 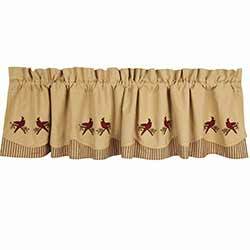 Features appliqued and embroidered cardinals and pine sprigs against a nutmeg tan cotton background. Scalloped edge is layered over nutmeg and barn red ticking striped fabric, with a straight edge. 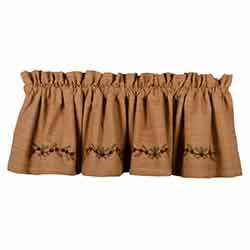 Features a string of applique felt holly berries and pine sprigs against a tea dyed cotton background. Hand dying process results in a different look piece to piece. 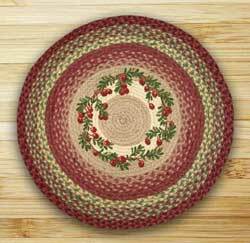 Christmas Braided Jute Trivet Set, by Capitol Earth Rugs. 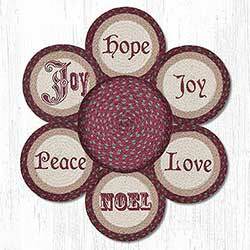 Features stenciled holiday messages - Noel, Joy, Pleace, Hope, and Love. Braiding is in shades of burgundy, green, and tan. Christmas Holiday Bottle Hat, by Tag. 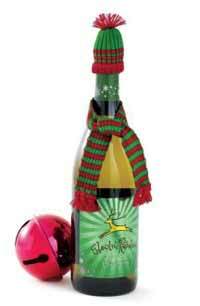 Accessorize your wine bottle with this darling knit hat and scarf set! Makes a great hostess gift. Hat measures 2 x 1.25 inches. Scarf measures 17 x 1 inch. This fun little puzzle consists of nine square blocks with vintage images on each side - arrange them together to make 6 different scenes! 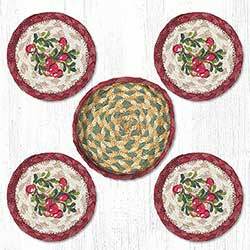 Cranberries Braided Coaster Set, by Capitol Earth Rugs. Features stenciled cranberries and leaves, great for everyday or Christmas decor! Braiding is in muted country reds and greens. Cranberries Braided Jute Rug, by Capitol Earth Rugs. 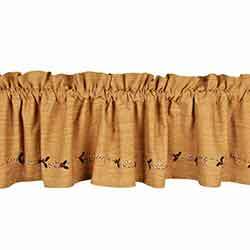 Jute is a natural fiber, considered to be a sustainable, environmentally friendly material. Water repellant, safe to put near a fireplace, spot clean with soap and water (or dry clean). This is for the Cranberries Braided Round Rug, which features stenciled artwork of a vine of cranberries, with braiding in reds, creme, and sage green. Measures 27 inches. As with all dyed jute products, take care to use a pad or otherwise protect items used with them, as colorfastness can be an issue. Emerald Cottage House Ornament, by Raz. 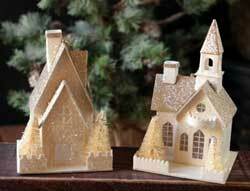 Vintage style putz house, in pretty gold and ivy, accented with glitter and bottlebrush. 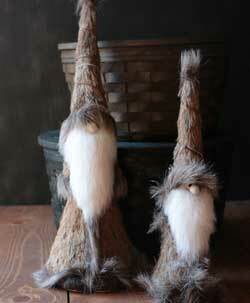 Sold individually from the two shown - Choose the Left or the Right ornament. Measures 5/5.5 x 3.5 inches. Part of the Emerald Cottage Collection. Made of paper, glitter, and sisal. 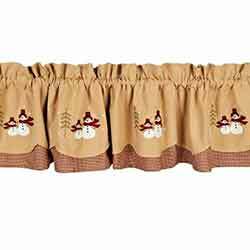 This fairfield valance features two layers of fabric - a tan cotton accented with embroidered and appliqued snowmen, feather trees, and snowflakes, with a lightly scalloped edge; bottom layer is a barn red and tan gingham mini check. 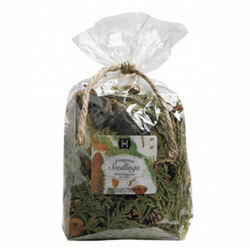 Evergreen Seedlings Bagged Potpourri, by Hillhouse Naturals. 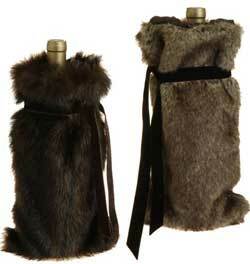 Fragrance: uplifting fragrance of whispering pine, spruce, juniper and cedarwood. This is for the Bagged Potpourri. 13 ounces of quality potpourri with no fillers. 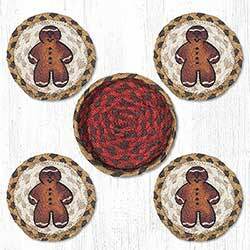 Gingerbread Man Braided Coaster Set, by Capitol Earth Rugs. Features stenciled gingerbread men, great for your Christmas decor! Braiding coordinates with the burgundy, green, and sunflower rug colorway. 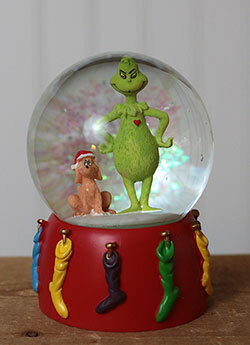 Grinch's Small Heart Grew Water Globe, by Department 56 / Enesco. Part of the Dr. Seuss Village Collection. Measures approx 5 inches tall. Made of glass and stone resin. Other Seuss items also available! Photo courtesy of Enesco. Holiday Bow Photo Frame, by Hanna's Handiworks. Prettle little photos frame, perfect for a small spot, like a shelf in your kitchen or on your desk at work! Silvered, antiqued resin, sold individually from the three shapes shown - Choose the Heart, Oval, or Square frame. Measures 3½-4"W x 4¼-4¾"H x ½"D (inches). Made of resin. Bow is covered in glitter. 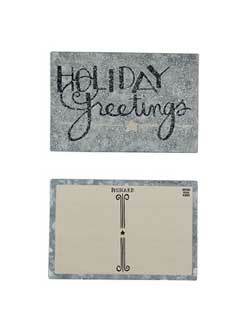 Holiday Greetings Tin Postcard, by Primitives by Kathy. Features black and cream lettering painted on a galvanized tin postcard that can be set on a shelf, or actually sent in the mail! This one reads: "Holiday Greetings." Measures 6 x 4 inches. Made of metal, intentionally distressed for a rustic look. 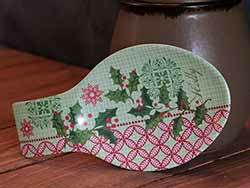 Holly Holiday Spoon Rest, by Kay Dee Designs. Features the holiday artwork of Sandy Clough. Silicone ring on bottom so spoon rest stays in place. Oversized, at 10.5 in x 5.5 inches. 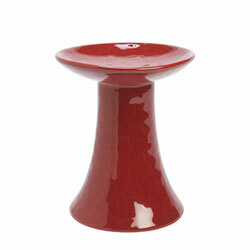 Made of durable melamine. Holly Top Hat, by Raz Imports. 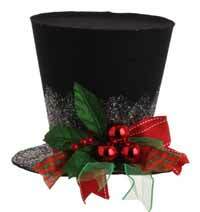 In the style of Frosty the Snowman, this black top hat has made a fantastically popular tree topper! This is for the medium size, measuring 7 x 8 inches. 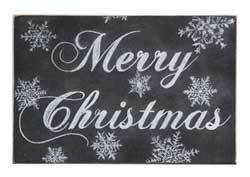 Made of black polyester felt, dusted with snowy glitter, and accented with red and green ribbons and ornaments. 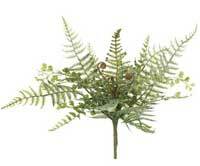 Turned upside down, it also makes a fantastic table accents, filled with floral fronds and decorative sprigs. Part of the Sentimental Season Collection. Larger version also available! Iced Fern Spray, by Raz Imports. 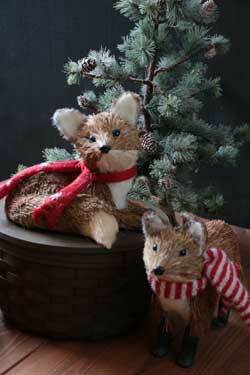 Tuck into your woodlands-themed tree, or tuck into a shelf. Part of the Forest Frost Collection. Measures 15 inches. Made of plastic. Jack Frost Concentrated Oil, from Allure by Judy Havelka. Has a spicy cinnamon fragrance with a bit of cool sweetness. Ideas for use: put a few drops on your favorite potpourri to refresh it, dab oil onto air conditioner and heating filters, soak cotton ball and put in vacuum sweeper bag, use with lamp rings or tea light/electric potpourri warmers, refresh your potpourri or rosehips, drop oil into a pot of boiling water. A little goes a long way, and the possibilities are endless! 1/4 oz in a glass bottle. Jack Frost Tarts, from Allure by Judy Havelka. Highly fragranced wax potpourri tarts by Judy Havelka. Jack Frost is white in color, and a hot cinnamon fragrance tempered with a cool sweetness. 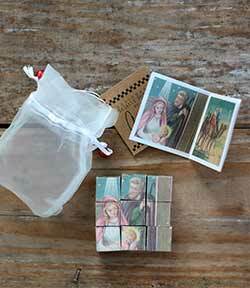 One package contains 6 wax cubes, for use with a wax melter/tart burner. Merry Christmas Wooden Postcard, by Primitives by Kathy. Features black and white chalk art decoupaged to a wooden postcard that can be set on a shelf, or actually sent in the mail! This one reads: "Merry Christmas." Measures 6 x 4 inches. Made of wood and paper, intentionally distressed for a rustic look. More Wine Bottle Tag, by Primitives by Kathy. 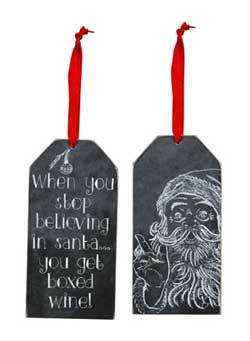 Features black and white chalk art decoupaged to a white wooden tag with hanging ribbon. 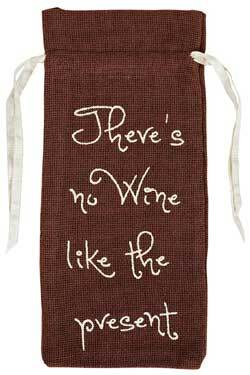 Use as a gift tag, a wine bottle hanger, or an ornament! 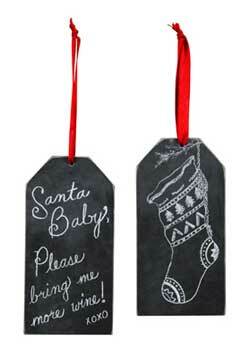 This is one reads: Santa baby, please bring me more wine!" Measures 3 x 6 inches. Made of wood and ribbon, intentionally distressed and aged for a rustic look. Photo shows front and back. Slim notepad featuring evergreen tree artwork and buffalo plaid. Reads: Welcome to our neck of the woods. Owl Be Home For Christmas Trees, by Raz. 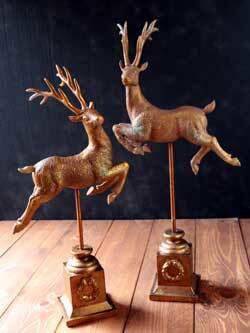 Set of two darling tall, slender resin trees, perfect to go with your holiday displays! 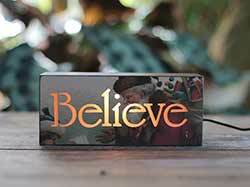 Looks great on a mantle or side table, with snowman figures, holiday houses, etc. 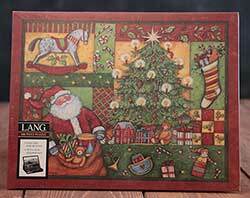 Patchwork Christmas Puzzle, by Lang. Beautiful 500 piece puzzle featuring full-color artwork by Susan Winget. Box size is 11''w x 8-1/2''h x 1-1/2''d, finished puzzle size is 18 x 24 inches. Makes a great gift. Other puzzles available! 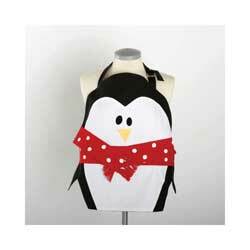 Adorable child-sized penguin apron. 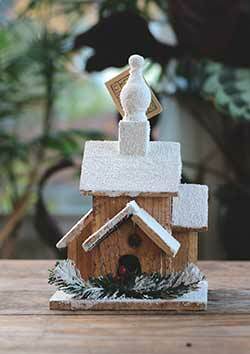 Part of the Magic of Christmas Collection. 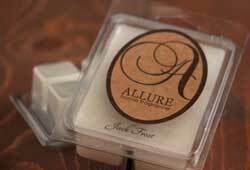 Piney Woods Concentrated Oil, from Allure by Judy Havelka. Smells like a pine forest! Ideas for use: put a few drops on your favorite potpourri to refresh it, dab oil onto air conditioner and heating filters, soak cotton ball and put in vacuum sweeper bag, use with lamp rings or tea light/electric potpourri warmers, refresh your potpourri or rosehips, drop oil into a pot of boiling water. A little goes a long way, and the possibilities are endless! 1/4 oz in a glass bottle. Piney Woods Tarts, from Allure by Judy Havelka. Highly fragranced wax potpourri tarts by Judy Havelka. 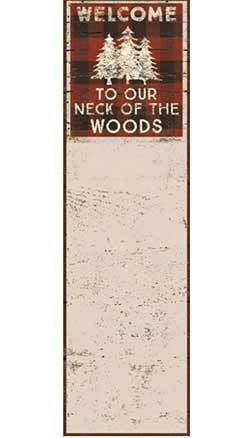 Pine Woods is mottled hunter green in color, and smells like a pine forest! 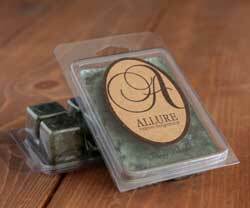 One package contains 6 wax cubes, for use with a wax melter/tart burner. Really Drunk Bottle Tag, by Primitives by Kathy. Painted and aged in white with red glitter lettering, with decorative paper decoupaged to back. Use as a gift tag, a wine bottle hanger, or an ornament! 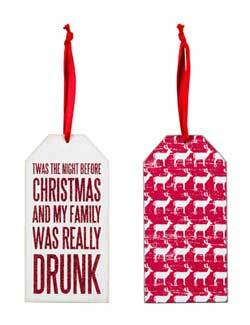 This is one reads: T'was the night before Christmas and my family was really drunk." Measures 3.25 x 6.25 inches. Made of wood and ribbon, intentionally distressed and aged for a rustic look. Photo shows front and back.